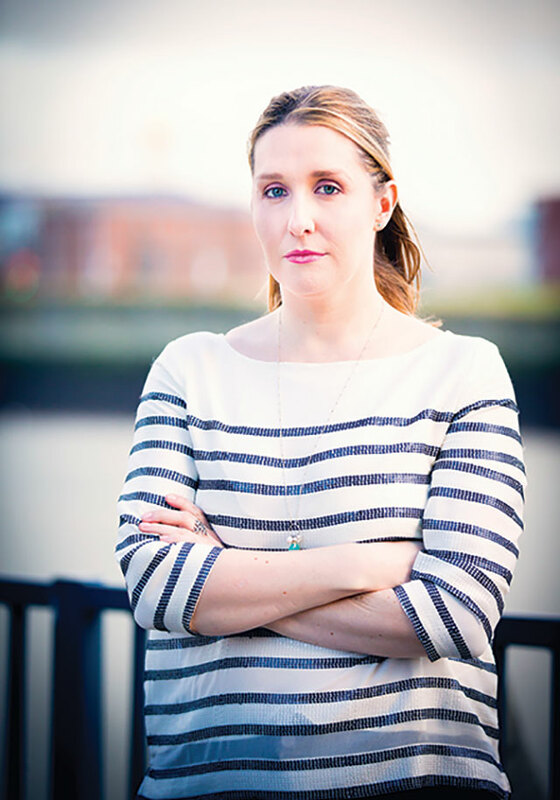 Journalist at the Belfast Telegraph Rebecca Black discusses her passion for the job, admiration for the late Liam Clarke and the pros and cons of social media in shaping modern news coverage. Initially I took some time to decide whether I wanted to pursue archaeology, politics or journalism. So many people warned me off journalism because it is a tough career. After completing my BA Honours degree in history at Trinity College Dublin, I took a year out to work at Stormont before deciding to take the plunge and follow my childhood dream of becoming a journalist. I enrolled at Belfast Metropolitan College in September 2006 for the then Newspaper Journalism course and by January 2007 I was doing shifts at the News Letter during weekends. By the end of the course in June I was offered full-time freelance work at the paper. Since then I have also worked at the Irish News before securing a staff job at the Belfast Telegraph in 2013. In that role I have been a reporter and Education Correspondent. Extremely varied. Although I am now a General Correspondent I cover education stories as well as politics, general news and Belfast City Council. I also cover digital shifts and Newsdesk shifts during weekends. Usually my day on a reporting shift starts by checking through my emails, social media, Assembly Questions and any Freedom of Information Act request responses I have received for story ideas. I pitch a number of these to my line manager, the News Editor, and continue to research until morning conference is over when I discover which stories have been placed or whether there is anything else they need me to work on. Throughout the day there is a constant flow of information and breaking stories which are prioritised. I can end up going out to Stormont to doorstep a politician, to interview a family who has lost a loved one or to speak to someone for our Monday Big Interview series. The late Liam Clarke was one of the reasons I got involved in journalism. I used to love reading his column in the Sunday Times as a student and later I had the privilege of working with him at the Belfast Telegraph. I admired his fearlessness in pursuing major stories even in the face of opposition and how no matter who he was interviewing he had no hesitation in putting the tough questions to them. Yet there was also a softer side to Liam where he had tremendous empathy with those in sometimes difficult circumstances, and he could produce powerful interviews. My editor Gail Walker has also been an inspiration to me. I admire how she interviews people and can draw out incredible stories from them, for example her interview with the former First Minister Peter Robinson in 2010 in which he talked candidly for the first time about the effect revelations about his wife Iris had impacted on his family. 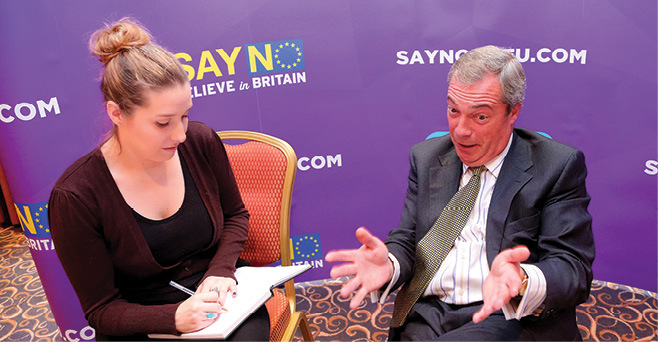 Rebecca Black interviews former UKIP leader Nigel Farage. I love the variety. I often joke to people that after almost 10 years in journalism I don’t think I could ever do a “normal” job where the duties are more or less the same every day. It is a privilege to be able to interview people and to win their trust to tell their story, often about some of the most painful experiences of their lives. I find people – no matter who – to be fascinating, and find that anyone can have an incredible story if the right questions are asked. One of the most challenging annual tasks is compiling the data for which transfer test grades each grammar school accepted. Since the abolition of the official transfer test the Belfast Telegraph has compiled a must read guide every January for parents showing exactly which grades each school accepted. It involves tracking almost 70 Freedom of Information requests to each of the schools and compiling them into easy to read tables. The process usually takes around five months. In recent months I have published a major investigation into the morale of staff at Hydebank College and also an exposé of Belfast Zoo’s membership of the international body EAZA being withheld over concerns. From 2010-14 I was the only Northern Ireland journalist to cover the Smithwick Tribunal in Dublin which examined claims of Garda collusion with the IRA over the murder of two senior RUC officers in south Armagh in 1989. I find digital to be one of the most exciting areas of modern journalism because there is so much potential out there to cover stories on multiple platforms. For example, when I was covering the Kingsmill massacre inquests late last year I was able to produce video interviews before proceedings started, tweet it as it was happening during the hearing and then go back to the office and produce a new angle for the next day’s print edition. Social media has revolutionised how we find a lot of information and also contacts, and while a great deal more caution is required with information acquired from social media, it can be a fantastic resource. One simple tweet to find a local person caught up in an international atrocity can transform coverage with a first person account. However, Twitter can be a double edged sword with some of the negativity you get back. I try to find constructive criticism where I can, while not taking personal attacks to heart. Be confident, have lots of ideas, be prepared to work very hard and try to find a niche. Journalism is not for the faint hearted. One of the hardest things I found was getting my foot in the door in the first place and learning to be assertive. You have to be extremely persistent to secure freelance shifts these days, and when you do get freelance shifts listen carefully to advice from your news editor and think about the editorial line of the newspaper when you pitch stories. I enjoy cooking, baking and reading to unwind. My perfect Sunday when I am off involves relaxing with the Sunday papers and some good coffee, a roast dinner and an indulgent pudding.